In the midst of the historic tribal protests against the Dakota Access Pipeline in 2015 -17, an 11½' marker arose in one of the camps of “water protectors” who had converged on the Standing Rock Sioux Reservation. It was quickly covered with handmade signs, showing the cities, states, tribal affiliations or countries from which the protestors had come, and how far they had traveled to join the protest. The mile-marker became a focal point within the camp, as well as a popular site to take selfies and photos of other water protectors. This mile marker is now the closing feature of the exhibition Nation to Nation: Treaties Between the United States and American Indian Nations at the National Museum of the American Indian in Washington, D.C. It stands as a reminder that American Indian treaties remain U.S. law, and that their stories are not finished. The marker is also a symbol of modern resistance. More than 350 tribes came to rally in opposition to the Dakota Access Pipeline when it was relocated near tribal land and water sources. The Standing Rock Sioux maintain that the pipeline threatens their lands and water. Originally the pipeline was to cross the Missouri River above Bismarck, the North Dakota state capital. But citizens there deemed that route unsafe for the city’s water. So the pipeline was redirected to cross the river above the drinking water source of the Standing Rock Indian Reservation, just south of the city. Protests against the Dakota Access Pipeline began in the spring of 2016 after young tribal members organized a run to bring awareness to the issue. In addition to protecting the water, the Standing Rock Sioux were intent on protecting treaty rights, protecting sacred sites and exercising the tribe’s right to consultation with the U.S. government. Representatives from other tribes, along with celebrities and allies from around the world, joined the protest. Protesters called themselves water protectors and established three camps near the pipeline construction site on the Missouri River. A new rallying cry was born – Mni Waconi, Water Is Life. While at the camps, the visiting water protectors proudly displayed their tribal flags, protest signs and other objects to show solidarity. Hickory Edwards (Onondaga), one of the water protectors, raised the mile-marker post in the Oceti Sakowin (Great Sioux Nation) camp, the largest of the three camps. Two other nearby camps were located on reservation land. In early 2017, protestors slowly began to disperse from the three camps. North Dakota Gov. Doug Burgum set February 22 as a deadline for the remaining protesters to leave the Oceti Sakowin encampment, which was on federal land near the area of the pipeline company’s construction site. The Army Corps of Engineers stated at the time that the protesters must leave due to a spring flooding threat. A day after the deadline, the Oceti Sakowin camp was cleared by local authorities and the National Guard. Edwards took the mile-marker post with him when he left, with the idea of donating it to the National Museum of the American Indian. Edwards and fellow protesters Konwenni Jacobs (Kahnawake Mohawk) and Bryanna Patinka delivered the mile-marker to the Museum’s Cultural Resources Center in Maryland. In October, the post was added to the ongoing Nation to Nation exhibition. 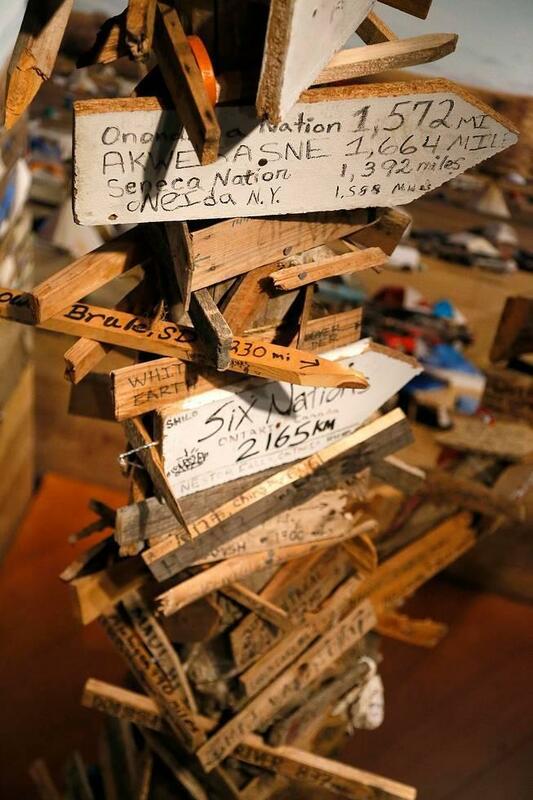 In 2021, when Nation to Nation closes, the mile-marker will go off public display, but it will remain in the Museum’s collection, where it will be cared for and where researchers, tribal representatives and others will be able to see it upon request. Nation to Nation focuses on the historic treaties made between the United States and American Indian nations. The U.S. Senate ratified more than 370 treaties with Indian nations before the treaty-making process was replaced by executive orders and acts of Congress. 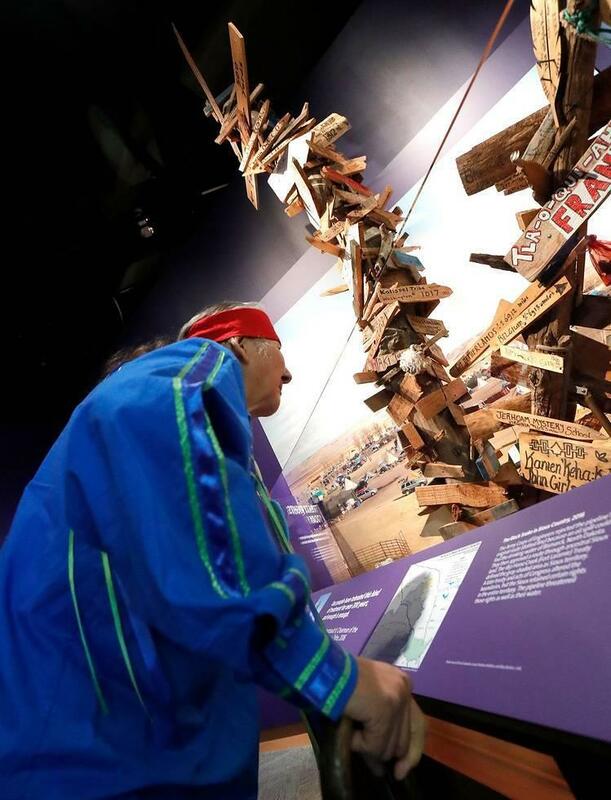 The mile-marker serves as a powerful reminder of the exhibition’s themes and especially of the never-ending struggle American Indians face to preserve their treaty rights. Dennis W. Zotigh (Kiowa/San Juan Pueblo/Santee Dakota Indian) is a member of the Kiowa Gourd Clan and San Juan Pueblo Winter Clan and a descendant of Sitting Bear and No Retreat, both principal war chiefs of the Kiowas. Zotigh works as a writer and cultural specialist at the Smithsonian National Museum of the American Indian in Washington, D.C.